There is a tendency, I think, among some who write about the Nazi Germans to become – too put it mildly – somewhat too close to their subject. That is the case with this book by a young Armenian historian. 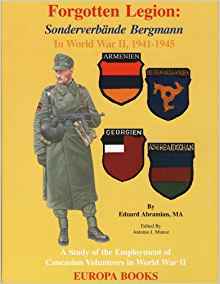 It describes in great detail but without much of a coherent narrative, the story of the Bergmann battalion, a notorious unit set up by German military intelligence to run commando raids and carry out acts of sabotage in the Soviet controlled areas of Transcaucasia. The battalion, which included volunteers from Georgia, Armenia, Azerbaijan and the North Caucasus, was widely praised by the Germans for its effectiveness. The author of this volume goes further, citing many examples of the unit’s bravery, singling out some of its soldiers for their heroism. And remember: he’s not writing about the large numbers of Armenians, Georgians and other who fought bravely in the Red Army against the fascists. He’s describing those who fought with the fascists, against partisans and others who were resisting the Nazis. This is a one-sided, partisan account that, unfortunately, takes the wrong side.